Some supposedly very smart, well-informed people are making ignorant and misleading claims in the debate over designating the Muslim Brotherhood as a terrorist group. The Trump administration is considering designating the nearly 90-year-old Brotherhood, which seeks a global Islamic state governed by religious law known as shariah. Reasonable people can debate the merits. But a recent Washington Post column by Arjun Singh Sethi, an adjunct Georgetown University law professor, illustrates the way false information is being pushed by some opponents. Designation would be "exploited and manipulated for political gain" and used to target otherwise innocent Muslim American groups, Sethi argues. It would be all the more outrageous because, "The Brotherhood doesn't have a known presence in the U.S., most Muslim Americans know very little about it and no organization active in the U.S. has been shown to have any connection to it." This is entirely wrong, and there are Muslim Brotherhood documents in the public domain to prove it. Sethi takes aim at one of those documents, a 1991 "Explanatory Memorandum" which calls for a "Civilization-Jihadist Process" whereby Brotherhood members in America work toward "destroying the Western civilization from within." The memorandum also suggests that Islam represents a "civilization alternative." "This memorandum, of which there is only one known copy, has been widely discredited and called a fantasy," Sethi writes. That one copy, however, was seized by FBI agents from the home of Ismail Elbarasse, whom prosecutors describe as the "archivist" for the Muslim Brotherhood in America. If it was a fantasy, it was deemed sufficiently exciting to preserve. In addition, its author played a prominent role in the Brotherhood's U.S. network. Sethi mentions none of these facts. Neither do the Southern Poverty Law Center or the left-leaning commentary website Alternet, which cited Sethi's column to dismiss those who point to Muslim Brotherhood fronts in the United States as "conspiracy theorists." Sethi further claims there is no evidence to show that "three of the largest Muslim organizations in the country — the Islamic Society of North America [ISNA], the Council on American Islamic Relations [CAIR] and the North American Islamic Trust [NAIT] — are affiliates of the Muslim Brotherhood" except for the explanatory memo. This statement also is objectively, demonstrably false. The explanatory memo, like most of the information known about a Muslim Brotherhood network in the United States, became public during the 2007 and 2008 Holy Land Foundation for Relief and Development (HLF) Hamas-financing trials held in Dallas. FBI agents seized a trove of internal documents – meeting minutes, reports and proposals – written by Muslim Brotherhood members in the United States. In addition, electronic surveillance picked up hundreds of conversations among Brotherhood conspirators. Their task at the time was to run a series of political groups with the aim of benefiting Hamas – the Brotherhood's Palestinian branch – politically and financially. They united under the umbrella of the "Palestine Committee." In court papers, federal prosecutors noted that the Holy Land trial included "numerous exhibits ... establishing both ISNA's and NAIT's intimate relationship with the Muslim Brotherhood, the Palestine Committee, and the defendants in this case." NAIT, a subsidiary of ISNA, served as a banking outlet for HLF's fundraising. "HLF raised money and supported HAMAS through a bank account it held with ISNA at NAIT...," prosecutors wrote in 2008, citing financial records admitted into evidence. "ISNA checks deposited into the ISNA/NAIT account for the HLF were often made payable to 'the Palestinian Mujahadeen,' the original name for the HAMAS military wing." CAIR, meanwhile, is listed among the Palestine Committee's own entities. CAIR Executive Director Nihad Awad is included on a committee roster and participated in at least one significant Palestine Committee meeting. Other groups attracted law enforcement scrutiny due to their Muslim Brotherhood ties. The International Institute for Islamic Thought (IIIT), for example, emerged from a 1977 meeting of Muslim Brotherhood luminaries from the U.S., Europe and the Middle East, according to Growth of Islamic Thought in North America: Focus on Ism'ail Raji al Faruqi, written by Muhammad Shafiq, IIIT chair of Interfaith Studies at Nazareth College in Rochester, N.Y.
A 1988 FBI report, obtained by the Investigative Project through a Freedom of Information Act request, identifies ISNA, NAIT and IIIT officials as "members and leaders of the Ikhwan [Brotherhood]." The FBI document summarizes an interview with an unnamed source who notes that "all Muslim organizations founded under the direction of the IIIT leadership have been organized ... in 'the Ikhwan model,'" with the aim of recruiting support for an Islamic revolution in the U.S.
"... [H]istoricaIIy members of the MSA and subsequently NAIT, ISNA and the IIIT have been IKHWAN members," the FBI document says. 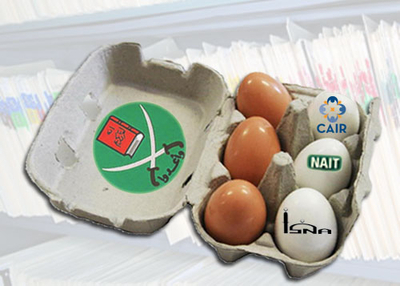 In sum, FBI investigations and internal Muslim Brotherhood documents establish that, despite Sethi's assertion to the contrary, there is ample evidence linking ISNA, NAIT and CAIR to the Muslim Brotherhood. His dismissal of the explanatory memo is similarly misguided. Its author, Mohamed Akram, played a prominent role on the Palestine Committee, identified in an internal 1991 document as the Central Committee secretary. He sat on the group's "Central Committee" with Hamas political leader Mousa abu Marzook. Akram's name also appears immediately following Marzook's name on the Palestine Committee's internal telephone. In 1990, Akram reported on projects for the U.S. Muslim Brotherhood's board of directors known as the Majlis al-Shura. The Shura councils in various countries all "report directly to the IMB [international Muslim Brotherhood]'s leadership," a 2010 Department of Justice affidavit filed in a deportation case said. Meanwhile, the Brotherhood maintains supporters in the United States. The IPT documented the connections between old Palestine Committee entities and the anti-Israel group American Muslims for Palestine. And members of Egyptian Americans for Freedom and Justice (EAFJ) and Egyptian Americans for Democracy and Human Rights (EADHR) openly display their Brotherhood loyalties on Facebook. EAFJ founding board member Hani Elkadi posted a cartoon of a man holding a sign with the Brotherhood logo and the words which translate to, "I am [Muslim] Brotherhood and I'm not threatened." Sethi is not the first to try to discredit the explanatory memo., The Bridge Initiative, an arm of Georgetown University's Prince Alwaleed bin Talal Center for Muslim-Christian Understanding, argued a year ago that the document was merely "one man's utopian vision." "If it occupied a central place in a Muslim movement to take over America, one would think his supporters would have taken up his idea and spread it in popular and academic circles. But that's not so," the Bridge Initiative Team wrote. It's a sweeping assertion. And it's not true. The Brotherhood has a multi-generational plan for establishing a global Islamic state. Its U.S.-based followers have repeatedly detailed their ideas for making it so. The 1988 FBI FOIA document describes a "six phase ... plan to institute Islamic Revolution in the United States" to be executed in part by the IIIT. The scheme was rooted in a 1983 book called "The Muslim Brotherhood." Like the "Explanatory Memorandum," the book emphasizes institution building and Muslim evangelization (dawah) as a prelude for jihad. "We want to make the whole world bow before the word of Allah, author Saeed Hawwa wrote. "The command of Allah is: 'And fight with them till no mischief remains, and the religion is all for Allah.'" Coincidentally, Akram mentions "six elements" of a general strategic plan adopted by the U.S. Muslim Brotherhood's Shura council in 1987 in the "Explanatory Memorandum." The memorandum likewise aimed to unify and direct Muslim efforts to present Islam as a "civilization alternative." IIIT publications still denigrate Western civilization in the name of Islam. The "problems and challenges faced by Western civilization in the contemporary era no longer find solutions on the social and economic levels of Western civilization," Adel Husein wrote in a 2013 IIIT paper. He suggests that Islam offers the solution: "Great revolutions are usually fueled by a solid doctrine, and Islam, in particular, embodies such a doctrine." Officials with other American Islamist groups advocate ideas similar to Akram's. In his 1989 book, The Methodology of Dawah, Siddiqi argues that Islam should be made "dominant in the USA" through the work of Muslim organizations. Muslims should help Americans view Islam as "an alternate way of life" for the problems of the day, Siddiqi wrote in his 1996 book, The Revival. Evangelizing the American intelligentsia will result in a "demand for an Islamic society and state," he wrote. The Muslim Brotherhood's ultimate goal is a global Islamic State, one that includes the United States. FBI agents have interviewed people with direct knowledge of those efforts and seized internal documents of a network engaged in the slow work of realizing that dream. Those who dismiss the explanatory memorandum as one man's fantasy either never bothered to look for corroborating evidence, or they know better and hope to fool the American people.